Best Hindi Tutorials is a website of Computer Science and IT Tutorials. 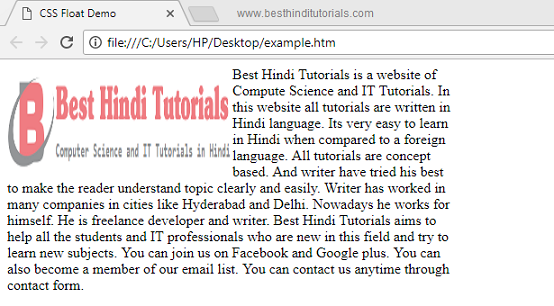 In this website all tutorials are written in Hindi language. Its very easy to learn in Hindi when compared to a foreign language. All tutorials are concept based. And writer have tried his best to make the reader understand topic clearly and easily. Writer has worked in many companies in cities like Hyderabad and Delhi. Nowadays he works for himself. He is freelance developer and writer. Best Hindi Tutorials aims to help all the students and IT professionals who are new in this field and try to learn new subjects. You can join us on Facebook and Google plus. You can also become a member of our email list. You can contact us anytime through contact form.